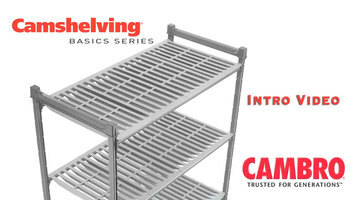 To assemble a stationary unit from the Cambro Camshelving® Premium series, first take note of its different components. There are braces, shelf frames, and removable shelf mats. Insert a brace onto the ends of 2 posts, oriented so that the arrow on the brace is towards the post ends. Slide the brace onto the posts, and use a mallet to secure it in place. Turn the posts right side up, slide the second brace onto the top of the posts, and again hammer it in place. The shelves come in 2 basic components. Take the shelf frame and line up the end with the notches on the post. Repeat until all sides of the shelf frame are in place. Next, place the shelf mats on top of the frame with the corner labeled "End" next to the corner of the post. Complete assembling the rest of the shelf by laying down the remaining shelf mats. Continue these steps until all shelves are assembled and the entire unit is ready for accommodating product. You need more storage space, but don't have all day to assemble shelving. With Cambro Camshelving®, you can set up a stationary unit in just minutes! Watch this tutorial to find out how. Cambro CPU244272V4480 Camshelving® Premium Shelving Unit with 4 Vented Shelves 24" x 42" x 72"
Cambro CBA183672S4580 Camshelving® Basics Plus Solid 4-Shelf Add On Unit - 18" x 36" x 72"